One day I shall own a Delorean. the code is not that complicated to be honest and not really my finest work either and to be honest there were some errors with mine so you are better off writing your own code for it.as for the wav files I got those from samples downloaded from various free wav websites or sampled them directly from the films. the thumper didn't work amazingly well, it was about 1 gallon in size. the way I did it was to have a variable with the the amount of milliseconds in it and use that in the delay function, then when the IR button is pressed for up decrease the milliseconds and when its pressed down increase the milliseconds in the variable. 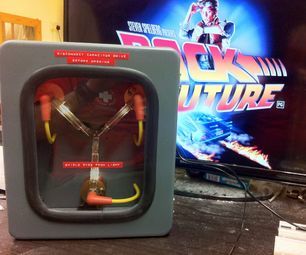 try that out.at some point I will be producing flux capacitors to sell not sure when though. I didn't update them no, you could try cutting them in half and then go from there. you may need to reduce them further. thank you so much for coming back here and posting your story, truly inspirational. wow that is an amazing story and a fantastic journey you have taken, I just made this for a bit of fun and you have taken it to the next level. I'm very proud of you guys for persevering and experimenting with it , my formula was far from perfect, way too strong in flavour and needed to be cut way back but I didn't have the time with work getting in the way to perfect my recipe. I love the bottles and labels you have there they look fantastic, i will have to a hold of one of each of those to have as a reminder of what I do sometimes inspires people to do great things. where can I buy them? I'm in the UK so it might be tricky. i'm in the UK so i work in C like the rest of the world ;-) but I honestly don't remember it was a long time ago I ran these experiments. i forgot about puking, good catch ;-) ok so if its puking and then you turn it down and it doesn't puke but your proof is low then your still is too full, simple. either run less at a time or have a bigger still to do the whole batch. either way you will be able to run it at a higher temp to get a higher proof however you don't want to comparmise the taste for the proof so bare that in mind. I have never experienced that, could be a dirty still, I clean mine before every run. it could also be running it too hot, but it shouldn't be brown it should be clear don't get impatient when heating the still up and whack the temp up to get it to boiling point just put it on a decent level that's not too high and wait for it to get to temp that may help too. if the airlock has stopped bubbling its probably finished so I would run it. I assume you followed my reciepe to the letter? the other option is it could be too cold for the yeast to finish working or too warm. the keys are just so the 2 halves of the mould will line up correctly. I had to buy them on ebay in the end. oh and if you are going to make this I would recommend flaring the end of it. you could add a couple of copper scrubbers, but not too many, remember if you have those scrubbers in there they will reflux and strip a bit of flavour.make sure you clean the still before you start and I mean everything, all the tubes and pipes, the boiler, everything. and then I would run some water through it e.g. boil the water in the boiler and allow steam to come out just to flush everything through before you start to run your batch. yes you would need to take the packing out of the column, ideally you would use a pot head on the still and not a reflux head. yeah that would probably convert the starches to sugars for sure, but you also get flavour as the bananas ripen and you want that Banana flavour in the brandy otherwise you are just making vodka. I assume thats the home distillers forum, let me know how it turns out. did you leave some skins in? probably not a good idea, Raisins have yeast inside them which could infect the batch. I have used Tomato paste as a yeast nutrient in Sugar washes, no reason you couldn't do the same here. I dont make them to sell.the keg new was £72 at the time and probably spent another £60 on copper parts and other bits. I would recommend using the correct attachment, however if you can run the still in such a way that it doesn't reflux then you may get away with doing that. this could be controlled by increasing the flow out of the still, removing packing in the column and controlling the temperature. i used hot glue to seal the holeyes that yeast will be fine, using a different yeast will just produce a different flavor profile. i only put water in to make sure my element is covered in my still this does not effect the % that comes out, how you run your still effects the % that comes out of it and you want it to come out slightly stronger than drinking strength. its a needle valve, you have much more control with a needle valve than a ball valve.stick to solid brass, brass is ok as long as its lead free brass. i wouldn't use plated brass, you dont know what materials were used in the plating process or the underlying material. use brass or stainless steel, if you can find a needle valve in copper then use that. Run it slower, it should slowly drip out not run out like a stream, if your running it too fast it will strip the flavour out of it. If you have followed the instructions with the correct amounts then it's down to running it too fast or your still head is too tall and its refluxing. You should be using a pot still for rum. I buy my molasses from ebay i get the gold label one, they use it as horse feed but its just plain molasses with no additives so its fine to use as it will be distilled and not consumed directly.http://www.ebay.co.uk/itm/MOLASSES-GOLD-LABEL-5LT-Horse-Feed-Supplement-/281629846583I normally get about 4 runs out of it. the stuff you are looking at is really really thick stuff and expensive. the Rum flavour comes from the Molasses, the alcohol content comes from the sugar you add and whats in the molasses. you probably could make up the shortfall with sugar not sure how much difference to the flavour that would make though. I've not noticed it before but then I clean my still regularly with vinegar solution so that should take care of that before it forms.that being said, the element is in a screw in flange so it could easily be removed and cleaned. they will need to be cut up so they can release their flavor.i would expect that if they are on ebay they are probably listed as bitter almonds but are not, unless they are coming from another country other than the UK. it depends on what you are making, if you are making Gin, Vodka or white Rum then no you don't have to wait for it to sit. if you are making a Whisky, Whiskey or Golden Rum then you would need to put it on oak which can take years if its done right, but there are ways to speed it up by having more surface area on the oak then it can be done in months but the long you leave it the better.